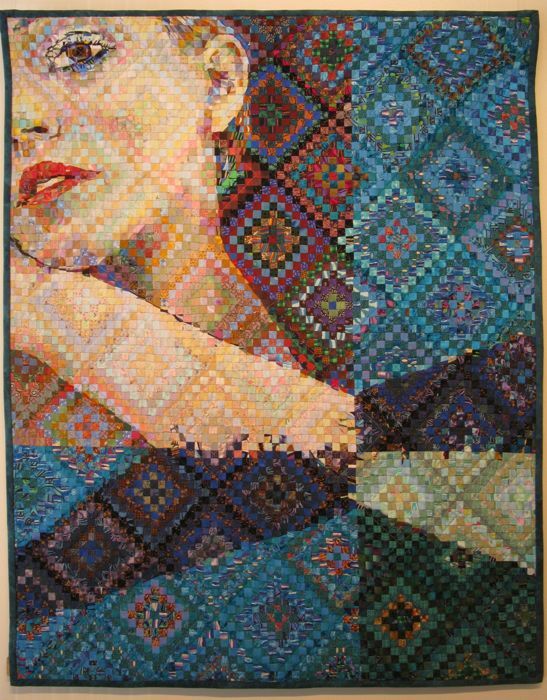 Block of the Month | OccasionalPiece--Quilt! 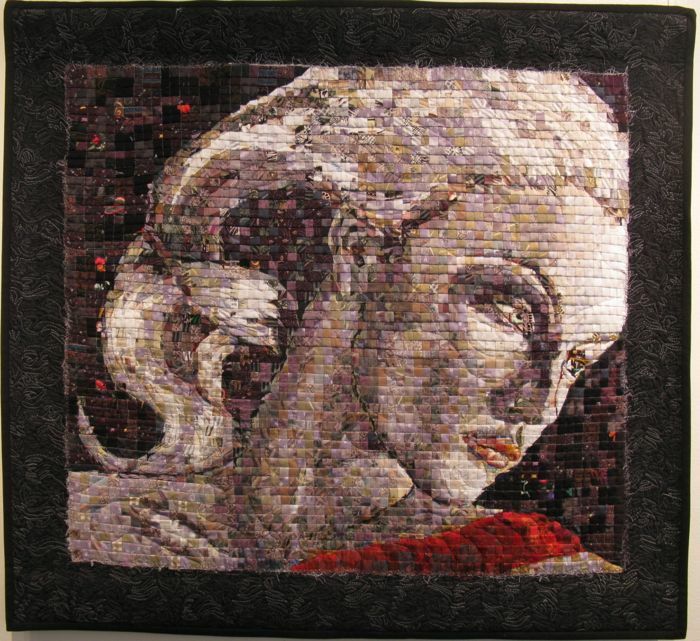 Posted on June 11, 2013 by Elizabeth E.
I love to visit City Quilter in New York City, for not only do they have amazing fabrics, they also have an attached art quilt gallery. 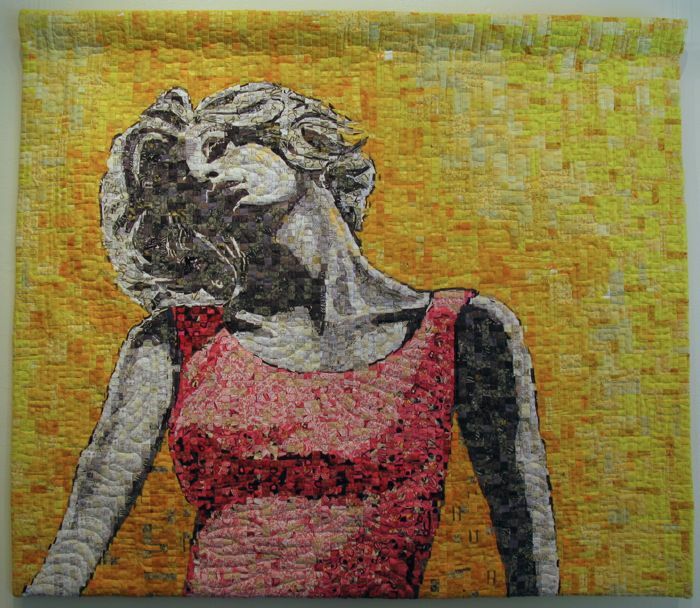 The exhibit when I was there was Deb Hyde: Sunshine and Shadow. 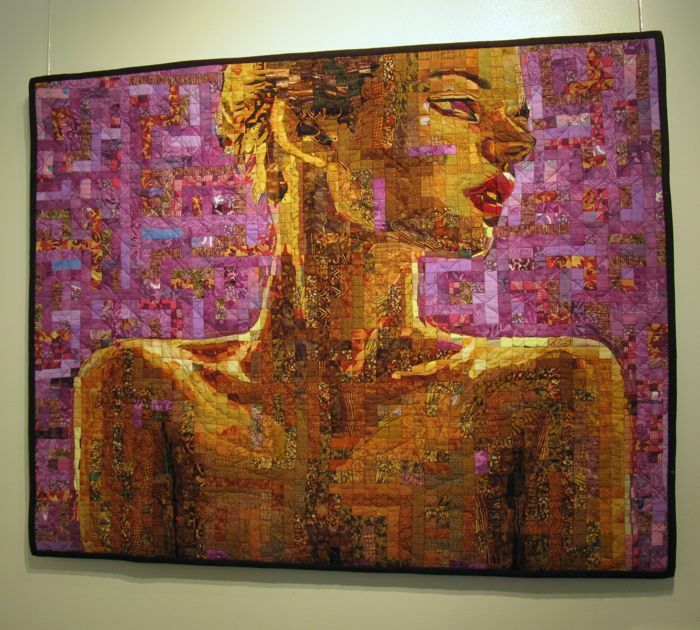 All the quilts were made of tiny pieces of fabric, fused to a grid, sewn then finished. 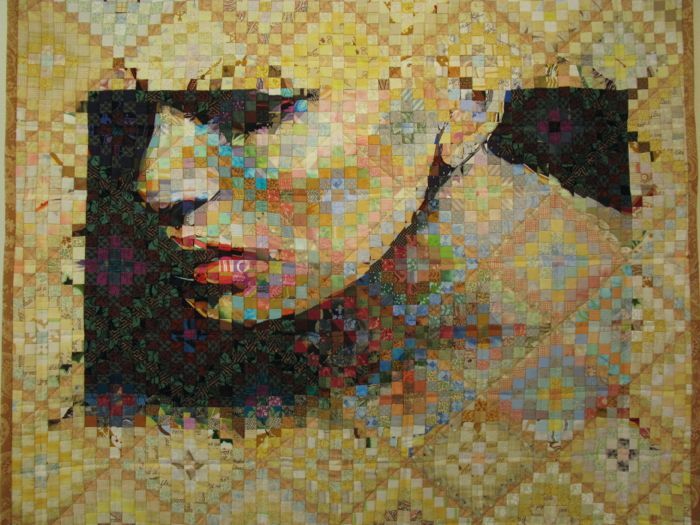 That makes it sound so elementary and perhaps the technique is, but it is Hyde’s use of color and pattern that elevate these quilts to a new level. 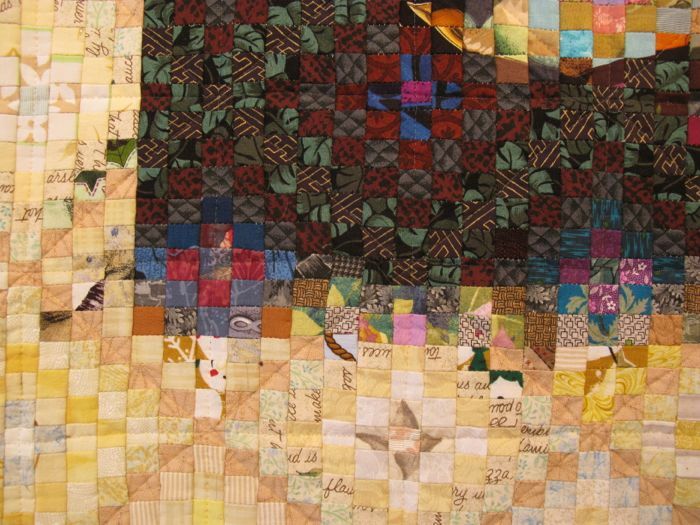 The above are increasingly detailed photos of the opening image, and it’s easy to see that she makes good use of fabric that we might relegate to the side of the fabric closet. One of her talents is the way she defines the body, the shapes, but also makes the background interesting with varied tones and values. 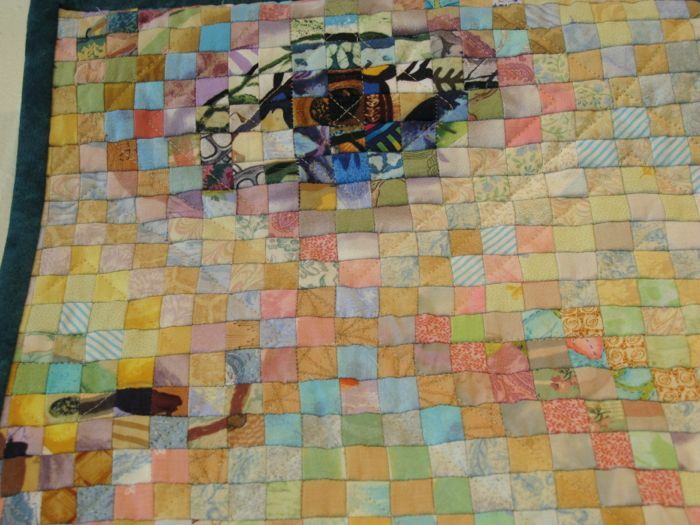 Check out the use of batiks to make the eye realistic. 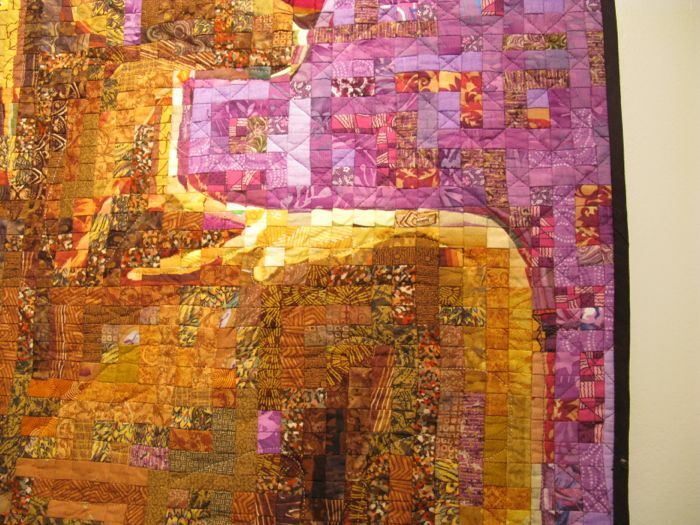 This quilt was up over the desk at the front of the gallery so I couldn’t get a good shot, but I love the way the light falls on the shoulders. 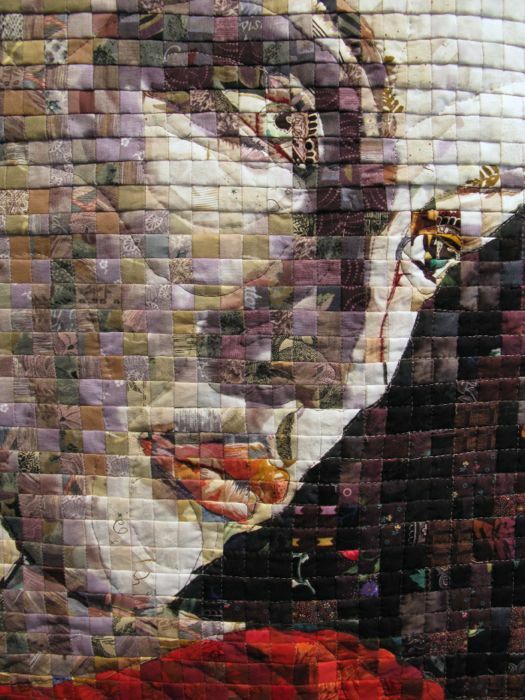 I became interested in how she quilted these. 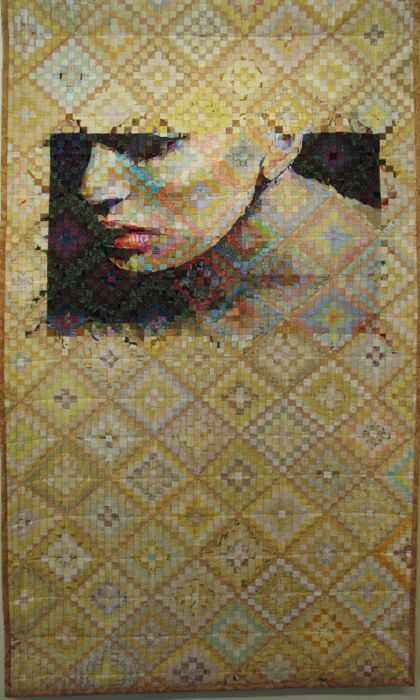 In my recent post I talked about Colorwash quilts and how we sewed millions of little squares together. 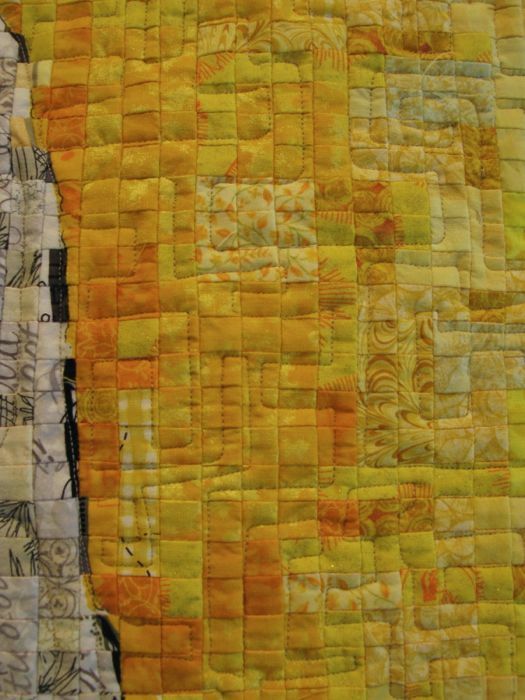 The newer method — of fusing them down — is an easier way, but it does make the quilts stiffer, so I wondered how the quilting would enhance and become a part of the composition, since it would be more noticeable in the thicker texture. 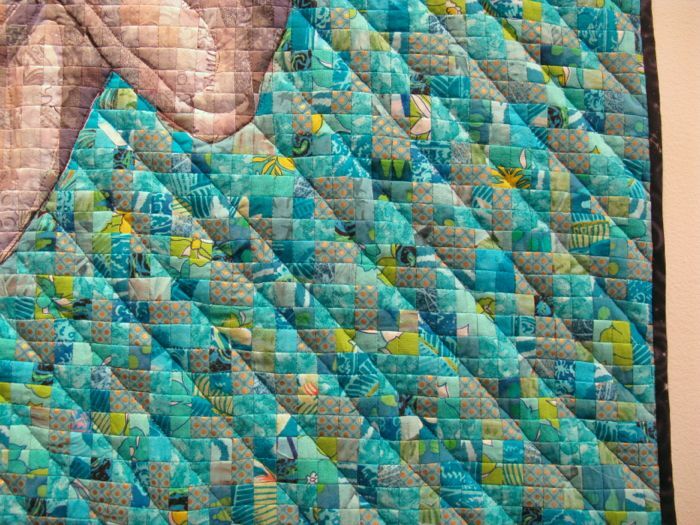 This is a simple diagonal quilting style. All over. 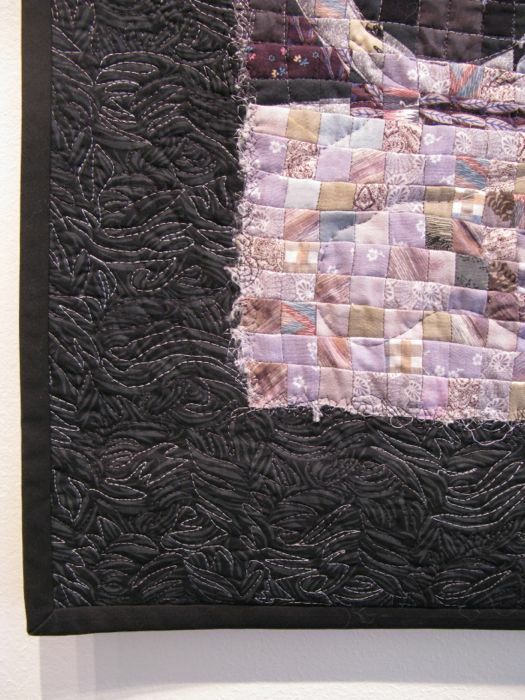 This piece (not shown in its entirety) is interesting because the grid appears to have been appliqued on top of the darker borders, with a scuffly, random stitching adhering and melding the two pieces into one. 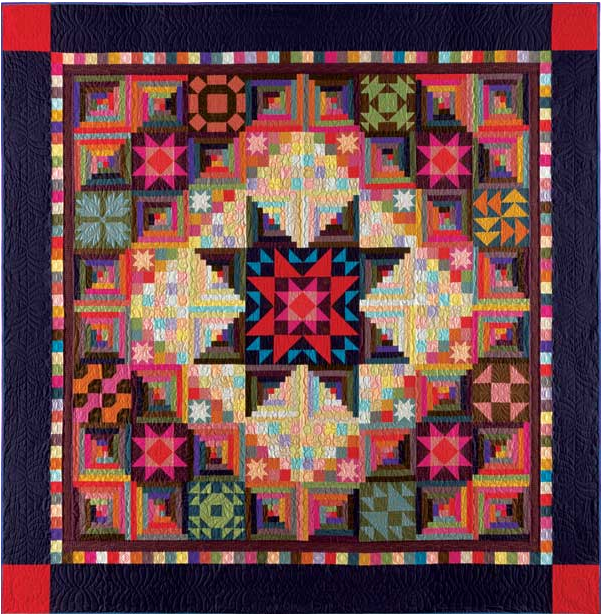 And while there, I glimpsed Amish With a Twist II, the newest Block of the Month quilt; I signed up for it, and the two installments of this BOM were waiting for me on the doorstep when I arrived home. 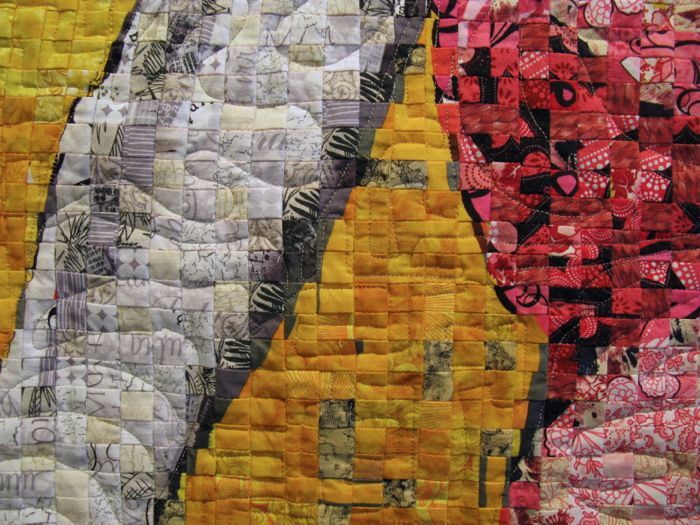 Quilting has kind of come to a halt around here, as my daughter and her three children have arrived for a week (circus circus, but really fun). Yesterday, while I watched waaay too many episodes of Wizards of Waverly Place (with Selena Gomez as the star witch), I started cutting out the first two kits. Other than losing my marbles with trying to figure out which color was which (Putty and Williamsburg Blue gave me extra fits of crazy), I successfully finish up the cutting last night. Now I’ve got to run–time for breakfast for three little people and their Mom!